NAR’s tenth Housing Pulse Survey shows a stronger environment for home sales and home ownership and less concern about jobs and foreclosures than in 2011. Survey is in, and the news is good! The National Associate of Realtors (NARS) recently released the 2013 National Housing Pulse Survey which shows that Americans outlook about the housing market has improved dramatically compared to past years. According to the survey on the NARS website, nearly all Americans have more concerns for home ownership and less concerns about jobs and the economy compared to previous years. The report provides further security to prospecting home buyers and creates a steadier housing environment for the future to come. It was just a few years ago that Americans showed a strong resistance to buying a home. Now, home ownership remains one of the top life priorities for people who currently rent. The survey was done via telephone and was spread over an area of 2,000 adults nationwide. The survey was conducted for NAR by American strategies and Myers Research & Strategic Services for NAR's Housing Opportunity program. Eight in ten Americans believe buying a home is a good financial decision, up 8% since 2011. 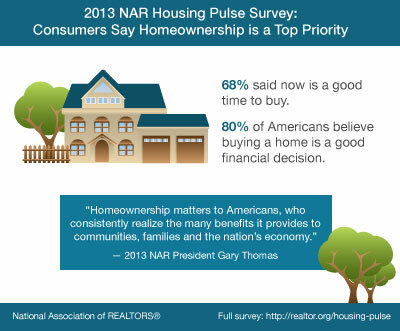 68% of those surveyed said that now is a good time to buy a house. Half of renters now say that eventually owning a home is one of their highest personal priorities, up 9 points from 2011, and less people have answered that they prefer to rent. Respondents expect to see continued improvement, as 37% expect real estate sales to increase in the year ahead. 38% of people say that they can tell real estate sales increased in the last year. Concerns about job layoffs and unemployment dropped 13% from 2011. The housing market recovery may have been a slow one but Americans are excited and more optimistic than ever before. Americans still believe in the importance of purchasing a home and even in our lowest point of 2011, 60% of Americans still thought buying was a good idea, up to 80% in 2013. This positive attitude about our housing market is great foreshadowing into an unyielding economic future. For information on purchasing a home click here, or apply online.